The U.S. Bureau of Reclamation has supported additional groundwater extraction in the San Joaquin Valley, where aquifer depletion is already damaging vital infrastructure. A new water-exchange project may also be spreading toxic soil contamination. 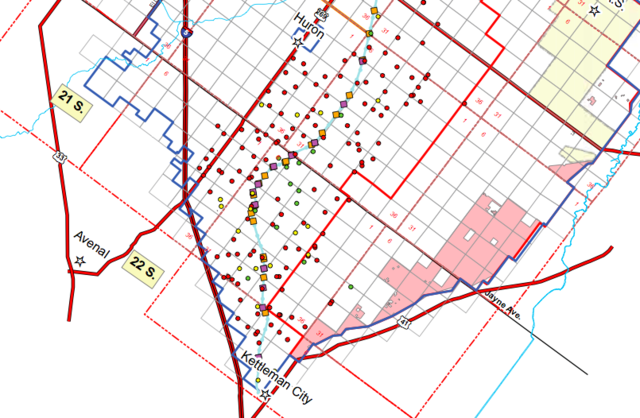 The San Joaquin Valley floor has been sinking for decades. So much water has been pumped out of wells in this arid agricultural zone that the land’s surface has caved downward almost 30 feet in places. As groundwater pumping continues amid the ongoing drought, it’s still sinking as rapidly as two inches per month. On the surface, the subsidence is causing roads and canals to crack as the earth collapses. Below the surface, much of the aquifer space is being lost and can never be recovered. Yet the federal government is encouraging the use of even more groundwater in this severely impacted zone. The U.S. Bureau of Reclamation has used tens of millions of taxpayer dollars to drill new wells in the San Joaquin Valley. Such activity will likely contribute to further land subsidence and require more taxpayer money to fix damaged infrastructure. In June 2015, Reclamation also approved a new water exchange project allowing a wealthy San Joaquin Valley farming district to pump more groundwater, deliver it to other farmers using the California Aqueduct and replace that with water exported from the imperiled Sacramento-San Joaquin Delta. The so-called Canal Integration Program pushed by Westlands Water District allows the major almond-growing region to pump as much as 30,000 acre-feet of groundwater annually in years when Westlands’ surface water deliveries are cut to 20 percent or less of its contracted allowance. This happened in 2015, and between July and October, Westlands pumped about 22,000 acre-feet of water under the new program from basins near the path of the California Aqueduct. The 400-mile canal is owned by the state of California, and its primary purpose is to distribute drinking water to 25 million people. The five-year water transfer plan, conservation groups say, threatens to accelerate subsidence-related damage to the canal that has already occurred. The project may also introduce selenium, a potentially dangerous natural element present at high levels in some Westlands soils, into the city of Los Angeles drinking water supply. Westlands had to apply with the Bureau of Reclamation for permission to undertake the exchange project, since it will involve transferring the water via a federally operated section of the state-run California Aqueduct, according to Shane Hunt, a Bureau of Reclamation spokesman. Gayle Holman, a Westlands spokeswoman, says the project will help Westlands farmers get through a very difficult time. Groundwater moved via the aqueduct, Holman says, will only be used to keep existing crops alive and not to expand planted acreage. Environmental groups are concerned because some of Westlands’ groundwater is tainted with selenium. Hunt, with Reclamation, says the water transfer project will not harm the state’s water supply. “There is generally only selenium near the surface, in the shallow groundwater, but not in the deeper groundwater,” he says. The two subterranean layers are distinct and separated by a mostly impermeable clay layer. Even so, it is not certain that selenium near the surface remains isolated there. Michelle Sneed, a hydrologist at the U.S. Geological Survey, says thousands of wells have pierced the floor of the San Joaquin Valley, creating “communication between the shallow and the deeper” aquifer zones – which could cause transfer of selenium in places. Sneed, however, emphasized that she does not study water quality and has not specifically looked at selenium levels in Westlands’ water. Holman says the wells to be used in the water exchange project meet safe drinking water standards. Hunt says approved wells will be monitored monthly. “If selenium goes above 2 parts per billion, the wells will be shut down,” Hunt says. The Safe Drinking Water Act names 50 parts per billion as the maximum limit for human consumption of selenium. Patricia Schifferle, director of Pacific Advocates, a resources consulting group, doesn’t believe monthly monitoring is frequent enough. “These industrial irrigators can game the system, discharging contaminated water without getting caught if they do it before the once-a-month monitoring schedule,” Schifferle said via email. Even if the water is perfectly safe for drinking, it could still kill wildlife by accumulating in higher densities in the food chain, says Felix Smith, a retired biologist with the U.S. Fish and Wildlife Service who spoke with Water Deeply. In 1983, Smith saw firsthand the ecological effects that selenium can have on wildlife when he discovered deformed juvenile birds at Kesterson National Wildlife Refuge, which was fed by agricultural runoff from Westlands. He believes similar consequences may result if selenium is introduced regularly into the California Aqueduct, which also supplies Kern National Wildlife Refuge. “If this water was just going to a human use, there probably won’t be any problem, but if it goes to a wildlife area where it can accumulate in plants and animals, then it’s going to be a problem,” Smith says. He says maintaining drinking water standards in the California Aqueduct fails to safeguard fish, wildlife and people. In July, water sampling by the Department of Water Resources found 1 to 2 parts per billion of selenium in the California Aqueduct, well below the safe drinking water standard of 50 parts per billion. Smith says selenium can bioaccumulate in agricultural crops, too – especially in the parts of plants that contain protein, like seeds. As for land subsidence, Reclamation officials don’t seem concerned. Others argue the project adds to subsidence problems that are already severe. Satellite surveillance in 2014 observed significant subsidence of the earth along the course of the California Aqueduct. A report from NASA’s Jet Propulsion Laboratory released on August 19, 2015, stated the ground below the California Aqueduct in at least one location subsided 13 inches between May, 2014 and January, 2015. Tom Farr, co-author of the report, says a similar rate of subsidence has continued in 2015. While land can rise and fall for reasons other than water pumping, such as tectonic shifting, Farr says the subsidence observed in the western San Joaquin Valley is too great to be the result of anything other than well-water extraction. “The subsidence also correlates with the location of the wells,” he says. Ted Thomas, information officer at the California Department of Water Resources, says the state has spent “tens of millions of dollars in the last 40 years to compensate for subsidence.” The California Aqueduct, and other canals, have cracked and buckled, he says, requiring repairs and various upgrades to the concrete lining of the canal walls. Sections of the Delta-Mendota Canal, another critical water conveyance structure connecting the Delta to the heart of the San Joaquin Valley’s farmland, have been damaged over the decades by subsidence, according to Hunt. The Delta-Mendota Canal is owned by Reclamation, and, ironically, was originally built in 1951 partly to reduce future groundwater extraction and the resulting land subsidence by bringing surface water to the region from the Sacramento-San Joaquin Delta. In response to ongoing subsidence in recent years, Reclamation has had to raise the canal lining to offset subsidence – as much as 18 inches in places – to ensure water will continue flowing properly in the canal. Reclamation is well aware of the long-term groundwater depletion problem in the San Joaquin Valley and the importance of recharging groundwater reserves. In December, for example, the agency unveiled a groundwater banking plan aimed at putting almost 100 million gallons of water into a depleted basin near Tulare, California. However, Reclamation has also used taxpayer money to drill dozens of new wells in the San Joaquin Valley. Dipping into funding from the American Recovery and Reinvestment Act of 2009, the agency spent $42 million between 2009 and 2012 on drought relief projects — mostly the drilling of 44 new production wells and refurbishment of 27 older ones in the San Joaquin Valley, according to Hunt. “Four of the wells we constructed supply water to wildlife refuges,” Hunt adds. The American Recovery and Reinvestment Act is intended to bolster the economy and create jobs. “But tell me how drilling wells in an overdrafted region is benefitting the public,” says Stokely, of the California Water Impact Network. California passed landmark groundwater regulations in 2014 that will limit and monitor the extraction of groundwater and the drilling of new wells. However, the Sustainable Groundwater Management Act will not result in significant regulatory actions for more than 20 years. Even if the act took effect tomorrow, land subsidence can continue for decades after groundwater overdraft is halted. “There are places where they’ve essentially stopped allowing water levels to decline for, like, 40 years, but they’re still seeing steady rates of subsidence,” says Sneed.